A sedan is pictured in company advertising material hauling the Camp 365. Albia Industrial Development Corp. President Dan Tometich used Monday’s Albia City Council meeting to deliver as good of economic news as last week’s national job survey. Tometich came to the council needing a motion and a signature to approve an Iowa Economic Development Authority High Quality Job Program Application for a Minneapolis area based company, Camp 365 that is planning to relocate its manufacturing facility to the south industrial park in Albia. The company has leased the former L&S Tools building on Benton Avenue West from Iowa Aluminum and Mike Lawrence. Work has already begun remodeling the interior of the building. They plan to break ground on a brand new $1.2 million, 25,000 square foot facility to be located just north and east of Iowa Aluminum with hopes of expanding the facility to 100,000 square feet. Tometich said their starting pay is above average wages in Monroe County and within two years could employ up to 150 people. 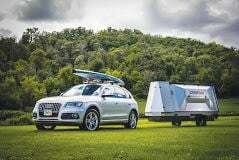 Called the “cabin that goes anywhere,” it is advertised as a camper that can be hauled on the open road by a car or pick-up and can “snake down mountain trails” behind a four-wheel-drive vehicle. The camper has an adjustable six-foot wheel base (relatively small for a camper, but folds out to maintain a 7’6” head space and room enough to hold eight people comfortably. Go to Camp 365 on the web to see the product and how it works via u-tube videos. Tometich said he has been working with the company since last spring after initial contact had been made by Chariton Valley Electric Cooperative. The company is also a customer of Iowa Aluminum. An economic development package was put together like previous packages put together for Relco, Ajinomoto and other companies coming to Monroe County that includes $500,000 in direct state assistance, zero percent Investment Tax Credits, along with loans from CVEC through its revolving loan program. Tometich was asking the council to approve a seven-year tax abatement that has the company receiving a 100 percent abatement the first year with declining percentages through year seven when they would receive a 15 percent property tax break. Tometich said the company owners will likely keep its main office in Eden Prairie, but they were drawn to South Central Iowa because of the nature of their product and its appeal to hunters and fishermen. “They were all aware of the Lovestuen Buck and Lake Rathbun,” said Tometich. The only concern voiced by Councilman Merle Regenold was the employee pool in Monroe County. “It’s a valid concern,” said Tometich. “Monroe County and surrounding counties share the same labor shed and it flows back and forth. We need to work on making Albia attractive to young workers. We need to work on housing and quality of life issues, not only for this new company but for all of our manufacturers. We want people to come here for work and we want to keep them. The vote to sponsor the high quality job program application, tying the city into the property tax abatement was approved unanimously. Also approved was the third and final reading of the fireworks ordinance which limits fireworks to the Fourth of July and New Years and the first reading of an ordinance to delete Section 146.18 (10) from the Albia City Code which prevented minors from entering establishments serving alcohol and beer.